Brokerage firm Cantor Fitzgerald, one of the tenants of the doomed World Trade Centre (WTC), is being sued by its former landlord for non-payment of rent. The WTC's leaseholder, a company controlled by property tycoon Larry Silverstein, has filed a lawsuit in Manhattan's supreme court claiming that Cantor owes over $1m (£600,000) in back rent. 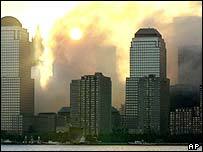 The sum covers the period from 1 August to 10 September 2001, the day before the WTC's iconic twin towers were destroyed in the biggest ever terrorist attack on US soil. "That obligation to pay rent continues notwithstanding the heinous attacks of September 11," the lawsuit filed by Mr Silverstein's company stated. A spokesman for Mr Silverstein said all of the other WTC tenants had acknowledged their obligation to pay rent for the five weeks to September 2001. "Cantor Fitzgerald has refused to do so and this lawsuit is the result," he said. Cantor Fitzgerald declined to comment. Cantor, which occupied offices at the top of the WTC's north tower, was the most seriously affected of the businesses housed in the twin towers. About 700 of its employees - two thirds of its workforce - died in the attacks. Both towers collapsed after being struck by passenger jets which had been hi-jacked by Islamic extremists, killing nearly 3,000 people.